The Society for Social Studies of Science is soliciting proposals for ‘open panels’ for its 2017 meeting, August 30 – September 2, 2017 in Boston. The purpose of open panels is to stimulate the formation of new networks around topics of interest and to facilitate the organization of robust paper sessions. Open panel topics, once accepted by the Program Committee, will be included in the call for papers, and authors may nominate their papers for one or more panels. An open panel may extend across up to three sessions of five papers each (i.e. a total of maximum 15 papers). If sensibility is the ability to grasp and to respond, how might we articulate the (in)sensibilities of contemporary technoscience? How, similarly, can we reflect on the extent and limits of our own sensibilities as STS scholars, teachers, and activists? The conference theme invites an open reading and exploration of how the world is made differently sense-able through multiple discourses and practices of knowledge-making, as well as that which evades the sensoria of technoscience and STS. Our aim is that the sense of ‘sense’ be read broadly, from mediating technologies of perception and apprehension to the discursive and material practices that render worlds familiar and strange, real and imagined, actual and possible, politically (in)sensitive and ethically sensible. Please note, in submitting a proposal, you are volunteering to chair a session of papers related to your topic. Open panel chairs will be consulted in regards to the selection of papers, but because of the need to distribute paper submissions over many sessions, the Program Committee has final authority over which papers will be included in each panel. In September this oddly haunting book came out that I can’t stop thinking about, for both good and bad reasons, and it is called “The Hidden Lives of Trees” (by Peter Wohlleben). Here is some background on the piece, including the “trees communicate” bit. We’ve talked about trees, but only occasionally, on the blog, which also reminds me of a piece in the NYT about social networks of trees (although that terminology might irk some). I recently had the opportunity to see the film Sully (2016), which recounts the 2009 emergency landing of a jetliner on New York’s Hudson River. Despite some critical flaws, the film is not only a thrill to watch but also provides much food for thought to those studying infrastructure. Even the flaws are instructive. One of them – certainly the most discussed – regards the portrayal of the National Transportation Safety Board (NTSB) that, as per protocol, investigated the accident. Whether due to Hollywood convention or directorial choice, the NTSB team are neatly cast as the villains, out to get the story’s hero by discrediting his decision-making process. An often overlooked aspect of how infrastructures impose (social) order is through transforming time into a trusty ally. One of their essential functions is to afford shared frames for enacting a window of opportunity. Like many out there, I have been watching with bated breath as Hurricane Matthew churns a destructive path through the Caribbean and, now, along the coast of Florida. Yet, by the time Matthew goes “live” on our news screens it is already too late to act. The window of opportunity is gone, and even emergency personnel must wait until it is safe to respond. The U.S. National Weather Service (NWS), however, has been closely monitoring this storm long before it became “Hurricane Matthew” to us. Charged with protecting life and property, NWS forecasters all over the East Coast were anxiously (and excitedly!) poring over the model forecasts and other weather guidance from the National Hurricane Center, deliberating over the uncertainty of the storm’s path and pondering how and when it was going to affect their area of forecasting responsibility. Remarkably, despite the great excitement and responsibility involved, the demeanor of the entire agency through it all has been calm, measured, and deliberate. We may take it for granted, but “speaking with one voice” represents a great sociotechnical achievement – at the NWS as well as anywhere else. As I discuss in my book, the NWS has cultivated sets of temporally judicious decision-making habits in its forecasters both by promoting expeditious meteorological skills and rules of thumb and by scaffolding the temporal architecture of a given task onto more or less fixed deliberation structures and technologically hardwired timing sequences. Specifically as it pertains to hurricane operations, NWS forecasters must abide by the storm tracks charted by the Hurricane Center and, in fact, cannot publicly divulge any information prior its official release to ensure “the issuance of information to all users at the same time on an equal basis.” As I had occasion to witness first hand, however, NWS forecasters don’t always agree with the pronouncements of the Hurricane Center, or of each other for that matter. And so, Hurricane Center forecasts/warnings are issued one hour before NWS field offices are to issue local hurricane advisories and warnings. This hour is the window of opportunity during which NWS forecasters will deliberate (via prescheduled conference calls and (ad hoc) chat room discussions) with the Hurricane Center as well as neighboring field offices about possible local amendments to the intensity/timing/track of the storm. Local expertise (in microclimatic conditions as well as community needs) is considered an asset at the NWS, militating for the existence of field offices in the first place. But eagerness to save the day and “nail the storm” can lead to flip-flopping, over/underwarning, or even bouts of indecision. It is especially for those fateful moments, when successfully utilizing windows of opportunity becomes paramount, that the NWS has sought to mold time into an organizational resource and forecasters into poised decision makers. When it comes to windows of opportunity, however, one size doesn’t fit all. Different time horizons call for different infrastructural regimes of decision-making action. Here I have only touched upon hurricanes, which are “long-fused” events. Forecasting tornadoes, or some such “short-fused” event, presents entirely different windows of opportunity. Predictably, therefore, NWS infrastructures during fast-paced scenarios call forth a set of skills and resources best suited for keeping up with the action, whereas slow-paced scenarios come bundled with an equivalent set of skills and resources, meant to elicit good long-endurance performance. In the end, time makes a fool of us all, of course; but, in the meantime, we might as well devise ways to turn it into our best ally. I am pleased to announce that Dr. Phaedra Daipha, whose first book I wrote about and enjoyed, will be a guest blogger on Installing (Social) Order this month (October, 2016). She is going to be telling us about her recent work in a new post every week or so. Personally, I am excited to learn more about her work about forecasting (weather forecasting, in this case) and especially her re-thinking of decision-making that extends in new directions previous models of “decision science” from the business school crowd, organizational analysis, and organization studies. Dr. Daipha a cultural sociologist working at the intersection of STS, organization studies, and social theory. Her research agenda centers on the nature, practice, and institutions of knowledge and technology production, with an eye toward understanding the development and transformation of systems of expertise and the emergence of new forms of coordinated action. She has employed a number of methods and data sources to examine such diverse fields of knowledge and technology production as academic sociology, weather forecasting operations, the commercial fishing industry, and medical care. Masters of Uncertainty: Weather Forecasters and the Quest for Ground Truth. She is currently in the process of completing her forthcoming book, How Doctors Make Decisions: The Role of Prognosis in Cardiology Practice, based on two and a half years of comparative fieldwork. This book builds on her previously developed model of the process of decision making to highlight the practical, materialist, prospective, and situationist character of clinical judgment and care. But it also considerably extends her earlier conceptualization by applying it to a decision-making field that is interventionist (rather than consultative), that relies on cross-functional (rather than single-specialist) teamwork, and that operates within a significantly longer window of uncertainty. Review of Casey O’Donnell‘s Developer’s Dilemma, which is in a similar vein as Ian Bogost’s Doing Things with Video Games and Nathan Altice’s I AM ERROR. This is an idea worth reviewing — imperfect, of course, but something of this ilk should be developed, at scale. You can see reports on this all over now: the Guardian, CNN, Washington Post, BBC, and so on. This comes on heels of much needed attention to maintenance, especially in terms of infrastructure, but with a new mechanism for incentivizing these behaviors on a wide swath of products, which re-articulates attention toward “demand” in a fresh way and away from “demand” as merely “voicing political concern” (which seems not to work, other than verbally). After reading a short piece by Christopher Jones (assistant professor of history at Arizona State University and author of Routes of Power: Energy and Modern America, 2014), I was reminded of just how essential “demand” is when it comes to actually getting politicians to invest in shared infrastructure (rather than fall back on ill-advised cost-savings measures that delay or push-back maintenance). The basic idea is that we are focused on “game changing innovations,” rather than the day-to-day maintenance of our infrastructure. For most of us, of course, effective roadways and public transportation are at least as important as ground-breaking innovations. But Jones goes a step further in our understanding of this, effectively suggesting that innovations primarily promote/aid/help the already wealth, monied upper-class elites who can benefit socially, politically, and financially from emphasis on innovation as opposed to maintenance on, for example, roadways, subways, waterways, and all manner of other ways. Jones’s solution: Demand it! (after all, we once did, and worked out rather well). See his new piece “New tech only benefits the elite until the people demand more,” and start demanding! Classic examples of corporatization of American colleges and Universities. This post links to one part of a three part series about colleges and universities in the US. The general topic is the high, high cost of American higher education. There are numerous reasons for this; however, the in-roads for this piece is the expensive food college students now often eat and the expansive infrastructural needs to support this transformation. This is part of Revisionist History (a great place for audio/podcasts/episodes). Teaching STS with "A fist full of quarters"
Teaching this again, right now, reminded of how nice the parallels are between “verifying a world championship score” and “verifying the truth of a scientific claim,” especially for students, for whom this verification process may seem unfamiliar or altogether too abstract. It’s only 5 minutes — give it a peek. I have been reading Pickering and Scott lately, especially on the practices associated with “legibility” (in this case, to the state, through the use of population categorization schemes, various forms of statistical analysis like the census and birth rates, and so on). This street art project almost seems like a state-sponsored translation project. Phaedra Daipha’s recent (20105) book Masters of Uncertainty: Weather Forecasters and the Quest for Ground Truth (University of Chicago Press) is worth picking-up, if only to appreciate and better understand the odd practice-world of weather forecasting inhabited by individuals whose weather predictions feature so prominently in local and national news, and, also, because frequently their prognostications shape the timings of our daily comings and goings (especially when we trust them too much or too little). Here is an interview with Daipha to give you a hint of what’s in store for the book. For social theory buffs, and especially for sociologists trained in organizational studies, cultural studies, and science and technology studies (like I was), this is a real treat. The bibliography is packed with the usual suspects: everything from heaps of Abbott, Fligstein, Barley, and Gieryn to Latour, Goffman, Giddens, and March, without forgetting Orlikowski, Perrow, Weick, and Vaughan. And there are many more I could gladly highlight. “Infrastructure” as a keyword for an upcoming volume on Infrastructure. While browsing through the New York Times I came across this gem by Carl Zimmer. Our microbe friends hard at work in the soil. Join Nick Rowland and me for a One-Day Graduate Student Workshop sponsored by the International Studies Association-Northeast Region. The field of International Studies has always been interdisciplinary, with scholars drawing on a variety of qualitative and quantitative techniques of data collection and data analysis as they seek to produce knowledge about global politics. Recent debates about epistemology and ontology have advanced the methodological openness of the field, albeit mainly at a meta-theoretical level. And while interest in techniques falling outside of well-established comparative and statistical modes of inference has been sparked, opportunities for scholars to discuss and flesh out the operational requirements of these alternative routes to knowledge remain relatively infrequent. This twelfth annual workshop aims to address this lacuna, bringing together faculty and graduate students in a pedagogical environment. The workshop will focus broadly on research approaches that differ in various ways from statistical and comparative methodologies: interpretive methodologies, which highlight the grounding of analysis in actors’ lived experiences and thus produce knowledge phenomenologically, hermeneutically, and narratively; holistic case studies and forms of process-tracing that do not reduce to the measurement of intervening variables; and relational methodologies, which concentrate on how social networks and intersubjective discursive processes concatenate to generate outcomes. In the two morning sessions, four established scholars, whose work utilizes such approaches as science and technology studies, narrative, visual culture, and postcolonial and diaspora studies will talk about precisely how they do their empirical work. These tutorial sessions will be followed by an extended afternoon session in which graduate student participants will have an opportunity to receive feedback from the established scholars and from their fellow workshop participants on their ongoing research projects. The workshop will be held in conjunction with the International Studies Association-Northeast’s annual conference, which will take place from 4-5 November in Baltimore, MD. Although all attendees of the conference may come to the workshop sessions, the graduate students officially participating in the workshop will have the opportunity to receive detailed feedback and specialized instruction in the methodologies under discussion. Graduate students interested in participating in the workshop should send their c.v. and a letter describing their current research project to Stefanie Fishel by e-mail: srfishel@ua.edu Applications must be received by 10 July 2016. The beautiful Mount Vernon neighborhood! Nightlife, great food and history! Yes, a high alert nuclear system is just that dangerous. Check out these nuclear close calls from the Union of Concerned Scientists. Great, quick read — possibly useful, in form and function, for generating teachable moments and useful learning projects. *This is similar, in some ways, to previous posts on NYC and natural gas infrastructure. It is an admittedly odd juxtaposition, but these two ideas landed on my desk this week. First, in an example of public participation in inquiry, “Chornobyl’s urban explorers find evidence of logging inside exclusion zone” — logging glow sticks in the “zone of alienation” (thanks dmf). A group of “stockers” roams the zone of alienation and monitor it, and they have found some interesting things in their somewhat odd form of tourism. “The first time we saw forests and the second time it wasn’t there,” says Kalmykov. Chernobyl is having a birthday. Interesting read about open source urbanism after the Pritzker Prize, by ALBERTO CORSÍN JIMÉNEZ. I am proud to be able to share an excerpt from a collective contribution to Millennium’s journal born from the annual conference “Failure and Denial in Global Politics” in London last October. In this article, Anthony Burke, Audra Mitchell, Simon Dalby, Daniel Levine and I argue that IR has reached the limits of its intelligibility with coming climate changes. We call for an expanded dialogue both within and beyond our disciplinary boundaries using the polemic and rhetoric of the manifesto to stimulate debate and response. This manifesto is not about politics as usual. We seek political imagination that can rise from the ashes of our canonical texts. It is about meditating on our failures and finding the will needed for our continued survival. Global ecological collapse brings new urgency to the claim that ‘we are all in this together’—humans, animals, ecologies, biosphere. To survive, we must ask questions that are intimately connected to capitalism, modernity, and oppression. We must ensure that our diplomacy, our politics, and our institutions are open to those who will bear the brunt of ecological change. Planet politics must emerge as an alternative thought and process: a politics to nurture worlds for all humans and species co-living in the biosphere. The local, national, and global no longer define our only spaces of action. The planet has long been that space which bears the scars of human will: in transforming the world into our world, we damaged and transformed it to suit our purposes. It now demands a new kind of responsibility, binding environmental justice and social justice inextricably together. We need not focus on who is responsible, but we do need to learn to adapt to the world we have created. We can dwell in this time of failure and still long for the surety of a future, a future that allows us all to survive and honours our deep entanglement with the planet. This is why we have chosen the polemic and political format of the manifesto. It aids us in searching through the old, getting rid of what no longer serves, and mixes up the political and personal to combine and confuse our political commitments. We don’t need more reports or policy debates. We need new practices, new ideas, stories, and myths. We must face the true terror of this moment. Carbon dioxide concentrations in the atmosphere now exceed those experienced for over a million years, and global greenhouse emissions trends show the planet hurtling towards a world, in this century, that is three to five degrees warmer than the preindustrial era. This is a world of melted ice caps and permafrost, flooded cities, oceans so acidic they cannot support life, and the loss of the Amazon’s rainforests. Ocean acidification, pollution, and overfishing may also see the extinction of all marine life by mid-century. At least 617 species of vertebrates have become extinct in the wild since 1500, exceeding the ‘background rate’ of extinction by over a hundred, and half the Earth’s wild animals have disappeared in the last four decades. All this is looming as much of the world suffers under a burden of extreme poverty and inequality, and communities from the Niger Delta to Bangladesh are condemned to live in ‘sacrifice zones’ devastated by oil drilling, mining, fracking, pollution, nuclear testing, and inundation. The 2015 Paris Agreement gave us hope that international society may yet reverse these trends and prevent dangerous climate change, but provided no firm and enforceable plans to do so. It was a window that magically appeared high on the wall of our prison cell, but the door remains locked. 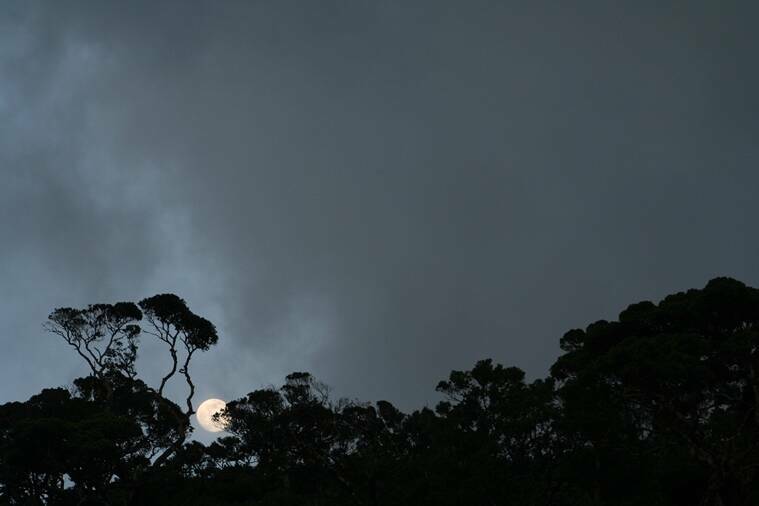 We agree with Timothy Morton, that the global ecological crisis ‘has torn a giant hole in the fabric of our understanding; that it is a vast ‘tear in the real’. Now our paradigms fail the real. International Relations, as both a system of knowledge and institutional practice, is undone by the reality of the planet. We must be in tension with status-quo struggles within our disciplines, and transgress academic boundaries to create conversations with activist networks and movements engaged in struggle against oppressive regimes and systems. If the biosphere is collapsing, and if International Relations has always presented itself as that discourse which takes the global as its point of departure, how it is it that we—IR’s scholars, diplomats and leaders—have not engaged with the planetary real? We contend that International Relations has failed because the planet does not match and cannot be clearly seen by its institutional and disciplinary frameworks. Institutionally and legally, it is organised around a managed anarchy of nation-states, not the collective human interaction with the biosphere. Intellectually, the IR discipline is organized sociologically around established paradigms and research programs likewise focused on states and the forms of international organisation they will tolerate; it is not organized to value or create the conceptual and analytical changes that are needed. The problems lie in the way we think and are trained; in the subjects and approaches our discipline values and rewards. Yet at the edges of IR—in NGOs, in critical geography, posthuman IR, global governance and ecological politics—a new consciousness is visible. That work cannot languish in dissidence, as so many earlier interventions have done. In our debates about the efficacy of the state, or the effects of globalization, we have missed what we were making: an era now termed the Anthropocene. This term represents an unprecedented change in the continued livability of planet Earth caused by the rapacious use of natural resources with no thought for current and future generations of humans, and of the millions of other species affected by changing climatic conditions and ecosystem damage. It is the power of human labour that freed carbon, and this element, once taken out of its molecular flows has created a metabolic rift, as McKenzie Wark writes, where the waste products of carbon’s extraction cannot be returned to a cycle that can renew itself. It is global in scope and new agendas must be designed to mitigate this rift. The Anthropocene represents a new kind of power—‘social nature’—that is now turning on us. This power challenges our categories and methodologies. It demands we find accomplices in our discipline and beyond it. It demands a new global political project: to end human-caused extinctions, prevent dangerous climate change, save the oceans, support vulnerable multi-species populations, and restore social justice. Action from this perspective is both more modest and yet more vital. Communicative, anthropocentric, and rights-based ethics can only guide and inform the discussion so far in understanding the challenges and opportunities in the Anthropocene. Security comes from being more connected, not less. Gone are the days of billiard ball states and national security based on keeping the Other out or deterred. The Other is always already inside, so bound up with us in a common process that it no longer makes sense to speak of inside and outside. We cannot survive without accepting the cosmopolitan and enmeshed nature of this world. We are an array of bodies connected and interconnected in complex ways that have little to do with nationality. States will wither in the coming heat, freeze in the prolonged winters, and be lost under the rising oceans. We will not survive without the biggest and most complex system we know: the biosphere. This may finally be the death of Man,but what will come next if this face is lost in the rising tides? Trying to write from within IR, we find ourselves prisoners in our own vocation. We are speechless, or even worse, cannot find words to represent the world and those within it. We do not hope that politics will suddenly change—but it must change. There is no magic bullet, no sudden realization, and no single policy that will ‘fix’ the damage done. The naysayers will stand in the ruins and tell us we are dreaming; that a new world is not of our making. Grudging admissions that climate change has been both long understood and actively denied do little; they cannot turn back the clock. Rather, we must embrace a multi-species, multi-disciplinary action plan. And we must do it now. We cannot unravel time and restore lost species to life, but we can fight for this planet we call a home. And so, knowing that even a ruined planet is worth fighting for, we declare our intentions for facing our discipline with delicate hope and a desire to face the planetary real with an unflinching gaze. *The full Manifesto can be found here* Please use this version for all citing and scholarly purposes. [1 ]Roy Scranton, Learning to Die in the Anthropocene (San Francisco: City Light Books, 2015). Global carbon budget project. Available at:http://www.globalcarbonproject.org/carbonbudget/14/hl-full.htm. Last accessed 16 November 2015. Gerardo Ceballos, Paul R. Ehrlich, Anthony D. Barnosky, Andrés García, Robert M. Pringle and Todd M. Palmer, ‘Accelerated modern human−induced species losses: Entering the sixth mass extinction’, Science Advances, 5, no.1 (2015). doi: 10.1126/sciadv.1400253; Damian Carrington, ‘Earth has lost half of its wildlife in the past 40 years, says WWF’, The Guardian, 1 October 2014. Available at: http://www.theguardian.com/environment/2014/sep/29/earth-lost-50-wildlife-in-40-years-wwf?CMP=share_btn_fb. Last accessed 29 January 2016. Naomi Klein, This Changes Everything: Capitalism vs. the Climate (London and New York: Penguin), 169. Bill McKibben, ‘Climate deal: the pistol has fired, so why aren’t we running?’, The Guardian, 14 December 2015. Available at:http://www.theguardian.com/commentisfree/2015/dec/13/paris-climate-talks-15c-marathon-negotiating-physics. Last accessed 15 December 2015. Timothy Morton, The Ecological Thought (Cambridge Mass. Harvard University Press, 2010), Kindle edition, loc. 203, 412. A brief sample of disciplinary work in international studies showing such awareness includes Simon Dalby, ‘Environmental Geopolitics in the Twenty First Century’, Alternatives: Global, Local, Political 39, no.1 (2014): 1-14; Erika Cudworth and Stephen Hobden, Posthuman International Relations: Complexity, Ecologism and Global Politics (London and New York: Zed Books, 2013); Rafi Youatt, ‘Interspecies Relations, International Relations: Rethinking Anthropocentric Politics’, Millennium: Journal of International Studies, 43, no.1 (2014): 207-223; Lorraine Elliott, ‘Cosmopolitan Environmental Harm Conventions’, Global Society 20 no.3 (2006): 346-363; Andrew Hurrell, ‘The State’, in Andrew Dobson and Robyn Eckersley eds.Political Theory and the Ecological Challenge (Cambridge and London: Cambridge University Press, 2006): 165-182; Robyn Eckersley, The Green State (Cambridge Mass. The MIT Press, 2004); Robyn Eckersley, ‘Deliberative Democracy, Representation and Risk’, in M. Saward ed.Democratic Innovation (London: Routledge, 2000); Hayley Stevenson, Institutionalizing Unsustainability: The Paradox of Global Climate Governance (Berkeley and London: University of California Press, 2012). Viz., Inanna Hamati-Ataya, ‘Contemporary ‘Dissidence’ in American IR: The New Structure of Anti-Mainstream Scholarship?’ International Studies Perspectives 12 (2011), 362-98; Richard A. Falk, A Study of Future Worlds (Free Press, 1975). McKenzie Wark, Molecular Red: Theory for the Anthropocene (London: Verso, 2015), xiii-xvi. “Hail the maintainers” — a must read. “It seems hard to believe there’s a graveyard for abandoned ships in New York City, but it’s true.” Check it out. There are some touching and interesting testimonials and memorials with his passing. I was always in awe of the scope of Urry as a thinker (so much so that, when asked, I felt almost professionally obligated to review one of his recent books). It was a favourite of Rabindranath Tagore, finds extensive mention in Punjabi literature, is the state flower of Jharkhand and is compared by Jayadeva in his Gita Govindam to the red nails of Kamadeva with which he wounds the hearts of young lovers. It is an integral part of celebrating Basant Panchami in Bengal and Shivaratri in parts of peninsular India, and its names are as varied as the geographies and the languages of this land — Palash, Dhak and Tesu in Hindi, Palas in Marathi, Pangong in Manipuri, Kesudo and Khakda in Gujarati, Moduga in Telugu. 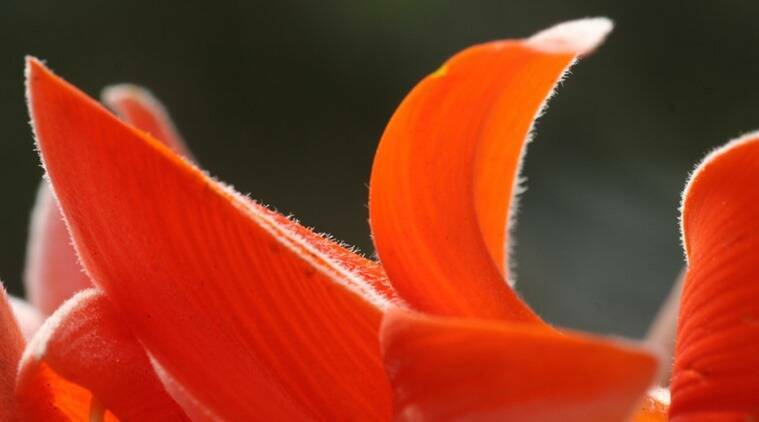 With petals the shape of a parrot’s beak and colour the vermilion of a forest fire, if there is one flower that epitomises the spirit of spring in South and Southeast Asia, it is Butea monosperma, known in English as the ‘Flame of the Forest’. Spread across the rural and forested (and often urban landscapes too), the nondescript tree that some even refer to as ugly in its non-flowering stage, comes alive with life and colour in spring. 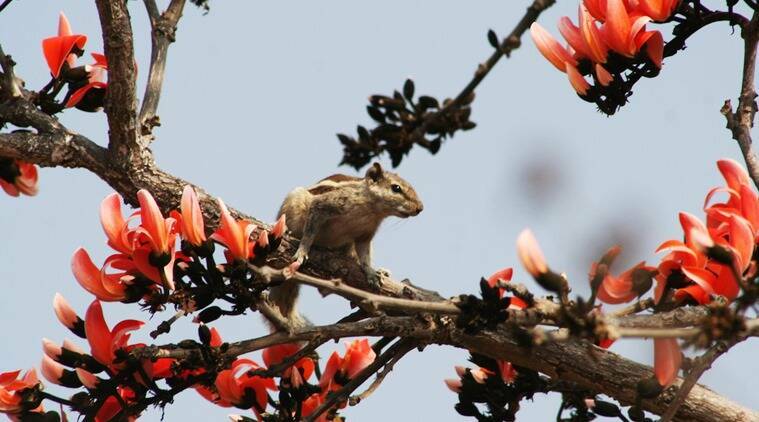 No one — be it man or woman, the purple sunbird or the little squirrel — can escape the lure of this flower that has, at this very moment, set the landscape ablaze with its fiery colours and striking beauty. Pankaj Sekhsaria is the author of The Last Wave — An Island Novel. And here is a report on my thesis and of the other two that were part of the project on the website of the Maastricht University…. Emerging technologies are often held up as miracle interventions: by bridging the divide between the Global North and South, they could change the world for the better. Yet in the past, nuclear power, biotechnology and ICT all failed to live up to their promise. Could nanotechnology, the next big thing, make the difference? For PhD candidates Pankaj Sekhsaria, Trust Saidi and Koen Beumer, this question formed the starting point of their research…. Very happy to announce that I successfully defended my PhD thesis last week (10 March 2016) and have now been awarded a doctorate. Please msg me or send me an email at psekhsaria@gmail.com if you would like to read the thesis and I will be happy to send you the pdf. A short (3 page) summary of the thesis is also available…. You can also write to me at psekhsaria@gmail.com and I’ll be happy to email the pdf across to you! I hope this is of interest to many. We are aiming to bring together people from STS, Valuation Studies, Social Studies of Finance and Accounting, Economic Sociology, and so on (see below). Feel free to get in touch early to discuss your ideas! A growing number of researchers across the social sciences are investigating valuation as a social process. Alongside the long-standing interdisciplinary research into accounting as social and institutional practice, a number of new fields of research and thematic banners have been arising in areas relevant to the study of valuation, fields such as the social studies of finance and sociological studies of “economies of worth” (see, among others, Callon, 1998; Boltanski & Thévenot, 2006; Callon, Millo, & Muniesa, 2007; Knorr Cetina & Preda, 2012; Aspers & Dodd, 2015). Valuation practices have been studied with respect to the construction of markets, firms or states, and they have been associated with the making of economic agency in various shapes and forms. Technological aspects of valuation from organizational routines to calculative practices, computer algorithms and information systems continue to figure prominently throughout such research. In particular, valuation devices – artefacts, processes or assemblages that enable, frame and bring about valuations – have been a focal point in interrogating and revising central concepts of social and economic theory, most notably with respect to concepts of economic action, markets, performativity, human and non-human agency. Despite such common focus, convergence of empirical findings is still limited with respect to how the spread and use of valuation devices affects the diverse social settings in which valuation takes place – and, critically, how the use of such devices transforms values and valuations. Recent publications indicate that such convergence is increasingly coming within reach (Kjellberg et al., 2013; Antal, Hutter, & Stark, 2015; Dussauge, Helgesson, & Lee, 2015; Kornberger, Justesen, Madsen, & Mouritsen, 2015). We observe considerable momentum across fields in addressing questions such as: how do tools and technologies of pricing, costing, indexing or projecting value change the ways people in firms, markets, in the profession, and in everyday life value goods, activities, or one another? To what extent do valuation devices create novel accounts of value? Are there regularities in the types of accounts and accounting which valuation devices bring about? In what respect do collective valuations change once they are increasingly supported by ready-made technologies of accounting, measurement and calculation? What is the effect of black-boxing valuation in artefacts and does the diffusion of such artefacts change, consolidate or dissipate economic agency? To what extent does it decentralise how value is being accounted for, e.g., through the use of social media or online rating systems? How does the diffusion of valuation devices across society affect the work and occupational niche of valuation professionals such as accountants or market analysts? The “Valuation, Technology and Society” workshop aims to build on the wealth of research currently addressing these questions by bringing together a broad range of scholarship from across (and not necessarily limited to) accounting, finance, anthropology, sociology, economics, history, science and technology studies, media studies or social psychology. We are specifically seeking papers that use in-depth empirical analyses of valuation devices in social contexts in order to address the analytical and theoretical challenges in understanding valuation as a social process and indicate points of convergence across cases. – the impact of valuation devices on banking and finance, for example, in the delivery of financial services in retail banking or the making of investment decisions; the extent to which the use of valuation devices has brought about and supported new forms of recruiting clients or interacting with stakeholders; the impact of valuation devices in creating new lines of business, for example in the emerging fintech sector and in blockchain banking; how valuation devices have transformed markets and organizational cultures through dynamics of disruptive innovation, pressures to innovate or the recruitment of IT talent. – the mobilization by valuation devices of different types of qualitative and quantitative data, algorithms, ratings and rankings; the ways in which they make use of ‘big data’ and internet traffic; how valuation devices make use of mobile computing. – the effect of valuation devices on technologies of the self through the introduction of new forms of measurement and value, for example, in health and personal fitness; how mobile or ‘wearable’ technologies are part of broader information systems in tracking fitness or risky behaviour; how valuation devices contribute to the management of populations. – how valuation devices affect the construction of social problems like economic growth, climate change, air pollution, immigration, public spending or sustainable development; how the scope of valuation has been extended to take into account social and environmental impacts of organizational action; the effects this has had on finance, investing and the management of risk. – the involvement of valuation devices in processes of reorganization and reform; their roles in dis-assembling and re-assembling organizations and institutions. – the effect of valuation devices on the competition among professions over the recognition of expertise and the struggle over professional jurisdictions; whether valuation devices instantiate particular forms of ‘adversary accounting’. – how valuation devices affect the very logic of account production, for example by involving customers and clients in the construction of ratings and rankings. – whether there is a specific role for valuation devices in valuing objects that are unique and ‘singular’, for example, rare items or works of art. – how different forms of social science contribute to the development of valuation devices; whether novel forms of social science are made possible through the use of valuation devices in society; the roles of accounting in exploring these possibilities. We believe that social science has much to gain from a more continuous understanding of how accounts of value are produced and circulated among human and non-human actors, facilitate action and organization, and underpin markets, networks and institutions. Please send an abstract (about 500 words) of your intended contribution by November 10th 2016 to the organizers of the workshop c/o Hendrik Vollmer, hv25@leicester.ac.uk. Antal, A.B., Hutter, M., & Stark, D. (eds.) (2015) Moments of valuation. Exploring sites of dissonance. Oxford: Oxford University Press. Aspers, P., & Dodd N. (Eds.) (2015). Re-imagining economic sociology. Oxford: Oxford University Press. Boltanski, L., & Thévenot, L. (2006). On justification. Economies of worth. Translated by Catherine Porter. Princeton: Princeton University Press. Callon, M. (Ed.). (1998). The laws of the markets. Oxford: Blackwell. Callon, M., Millo, Y., & Muniesa, F. (Eds.). (2007). Market devices. Oxford: Blackwell. Dussauge, I., Helgesson, C.-F., & Lee, F. (Eds.) (2015). Value practices in the life sciences & medicine. Oxford: Oxford University Press. Kjellberg, H., Mallard, A., Arjaliès, D.-L., Aspers, P., Beljean, S., Bidet, A., Corsin, A., Didier, E., Fourcade, M., Geiger, S., Hoeyer, K., Lamont, M., MacKenzie, D., Maurer, B., Mouritsen, J., Sjögren, E., Tryggestad, K., Vatin, F., & Woolgar, S. (2013). Valuation studies? Our collective two cents. Valuation Studies, 1(1), 11-30. Knorr Cetina, K., & Preda, A. (Eds.). (2012). The Oxford handbook of the sociology of finance. Oxford: Oxford University Press. Kornberger, M., Justesen, L., Madsen, A. K., & Mouritsen, J. (Eds.). (2015) Making things valuable. Oxford: Oxford University Press. UDC’s first Urban Colloquium of 2016 was held in Pondicherry with a presentation by writer and activist Pankaj Sekhsaria, on his work in the Andaman and Nicobar Islands, and about his new book The Last Wave, a novel set in the islands. The event was held in collaboration with PondyPHOTO. We thank Kasha ki Aasha for generous use of their space. Guest contributor Ketaki Chowkhani shares with us her thoughts on Pankaj’s presentation. In a fascinating post about walking, Will Self offers an uncommon walking tour of Bristol. According to Self, “walking was the way to break free from the shackles of 21st-century capitalism.” Walking tours, sometimes also called pedway tours, are growing in popularity; pedways are pedestrian walkways and they can be both above ground and below; they are sometimes discussed as a form of ungoverned or unplanned civil engineering.